If you’ve never created a business plan before, the thought of doing so can be a little daunting. Even business owners who are used to drawing up these documents will put the process off to the last minute and only put minimal effort into their creation. In fact, it’s not uncommon for people to view a business plan as something that is only used to attract potential investors and not realize how valuable a tool it can be to help manage a company or organization. However, since most investors and lending institutions do require some form of business plan, software developers have noticed the need for tools to help create these plans. As such, there are quite a few applications on the market dedicated to business plan creation. 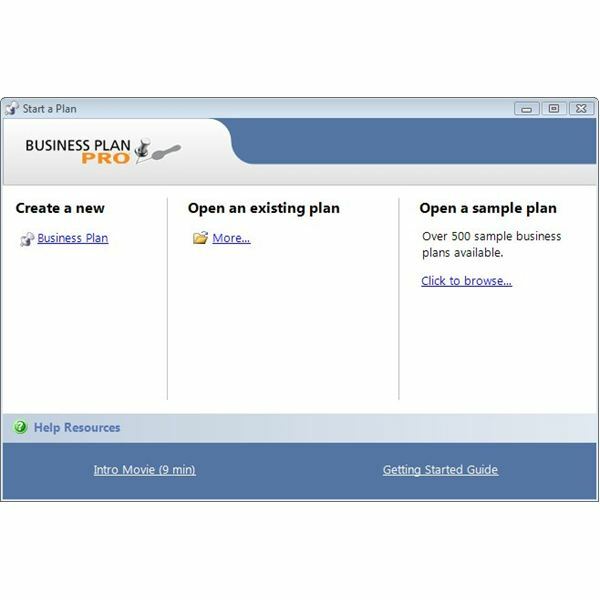 Business Plan Pro is one of these products, and it claims to help you create a completely customized business plan quickly and efficiently. In this review, we’ll explore the capabilities of the software and see if it lives up to these claims. When you first open Business Plan Pro, you’ll be met with a welcome screen asking if you want to create a new business plan, open an existing plan, or view one of over 500 sample business plans. This opening screen also provides links to a Getting Started Guide and an introductory movie, both of which are excellent resources for new users. If you’re the type who likes to jump right into a new software application without spending any time with tutorials, you should still be fine. After choosing the option to create a new business plan, a wizard will ask a series of questions to help determine which elements should be included in this plan. If you happen to make a "wrong" choice here, it’s no biggie since you can always add components later. Overall, I was surprised that an application capable of creating such complex documents was so easy to navigate and use. After using Business Plan Pro for a couple of hours, the software became seamless with the actual act of writing a business plan so that the only things I really had to think about were related to the business itself – not how I would incorporate the information into the plan. To make things even easier, Business Plan Pro has a built-in mechanism that can help you figure out how to word your own business goals and objectives. Each component of the plan has instructions as well as examples pulled from the collection of sample plans that comes bundled with the software. For instance, in the Mission Statement section, the instructions explain what a mission statement is and why you need one. Then, if you’re stuck for what to write, you can view examples from other business plans without ever leaving your current document. The software even has functionality that lets you paste any example into your own plan with just a click of a button, ready to edit to your own specifications. The Premier version of Business Plan Pro contains one of my favorite features – the ability to compare actual results with planned goals. This capability makes the business plan more of a living document, which it should be if you hope to get the most use out of it. The whole purpose of creating financial goals is to help you run a better business, and that’s hard to do if your business plan is shoved in a drawer all year long until it comes time to write a new one. 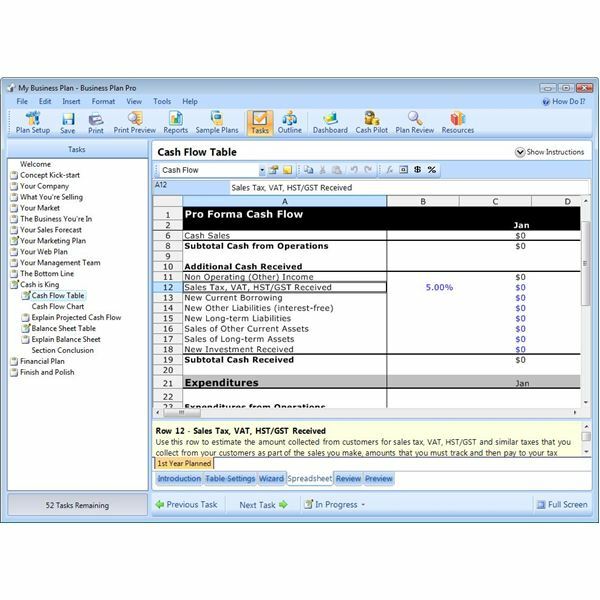 Another very nice feature of Business Plan Pro is that it allows you to create important financial documents, such as Cash Flow Pro Formas, quickly and efficiently. You can either enter the values yourself in a spreadsheet or use a very handy wizard that will walk you through the process, asking all pertinent questions along the way. Business Plan Pro also gives you the option of including a SWOT Analysis and website objectives in your plan. Again, this is crucial for those who want to create a business plan that is actually useful instead of a dust-collecting document requested by potential investors. The number of user resources provided by Palo Alto Software, the creators of Business Plan Pro, is simply phenomenal. To begin with, you’ll be met with links to entry level tutorials each time you open the application. The introduction movie that accompanies the software is about nine minutes long and is a fantastic guide that covers most of the basics of Business Plan Pro. If you prefer a non-video initial tutorial, the Getting Started Guide is an excellent alternative that walks you through the software’s features with explanations and screen shots. 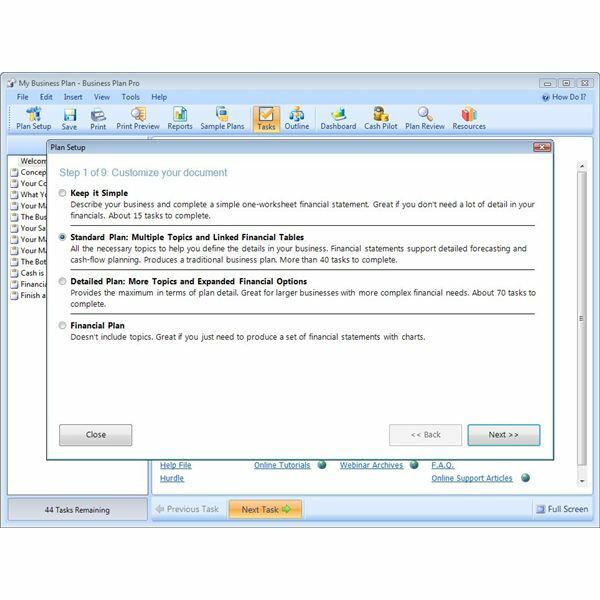 On top of that, you can access a number of tutorials on more advanced features of the software from the Business Plan Pro web site. The web site also contains information on how to deal with technical problems you may encounter. If you’re still at a loss, you can contact the customer care team either by email, live chat, or phone during standard west coast business hours. To further complement Business Plan Pro, Palo Alto Software maintains several additional resources on its devoted business planning web site. This site is a great place to visit even if you’re not an owner of the software since most of the tips and tutorials are geared toward helping business owners understand business plans and how to use them more effectively. 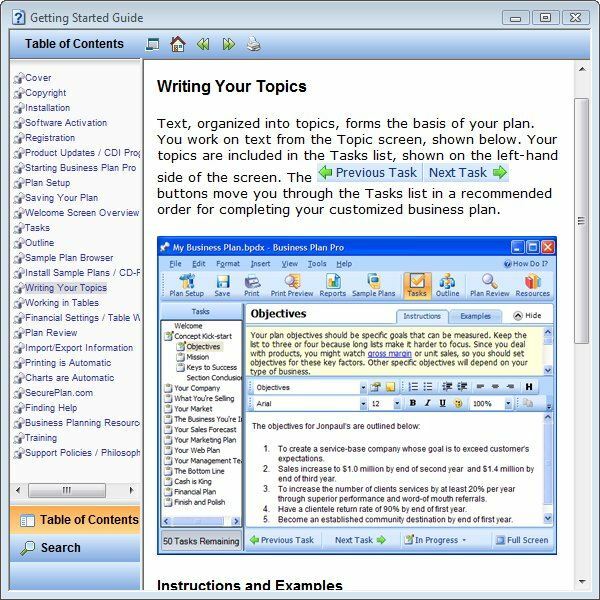 The Premier Edition of Business Plan Pro (the version evaluated for this review) runs $199.95 and includes all of the more advanced features such as plan vs. actual comparisons and import from Excel capabilities. There’s also a Standard Edition of the software available for $99.95 that is still quite robust but doesn’t include the plan vs. actual analysis functionality or several other features. For a full version comparison, check this list. Even though the Premier Edition is twice the cost of the Standard, the added capabilities make it quite worth the price. This is particularly true if you want to use your plan as a model to help run your business on a day-to-day basis. The trouble with most business planning software applications is that the finished product looks like it was created from a template. Now, that’s not always bad, but it can give the impression that you were creating the document solely due to a potential investor’s request. In the end, this approach really isn’t helpful to either your business or anyone else. Business Plan Pro is quite different in this respect as it allows you to create a completely customized document that not only can be presented to funding sources, but can also be used to manage and grow your business. In my opinion, Business Plan Pro is the best business planning software on the market with no close second in sight. In fact, if used to its full potential, it would be more apt to call the application a business management product that just happens to support the creation of stellar business plans. If you’re still shopping, make sure to keep this program on your short list.